Downstairs is an evocation of the grandeur of the Cape Colonial period, with a series of generously proportioned rooms with high wooden beam ceilings. The open plan traditionally-furnished kitchen area has a dining space and lounge. 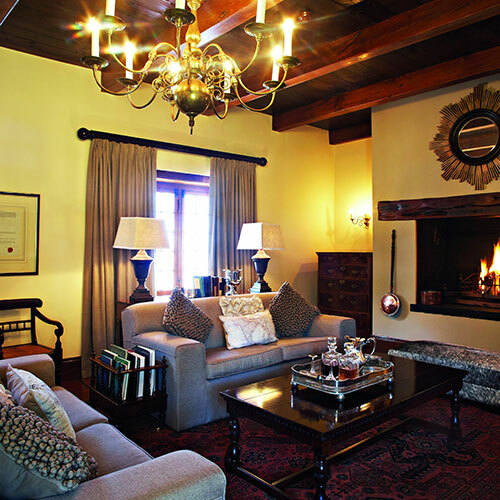 The main lounge has exquisite antiques from Cape stinkwood to English walnut and offers two full-sized sleeper couches and a grand fireplace. There is also a guest toilet downstairs. 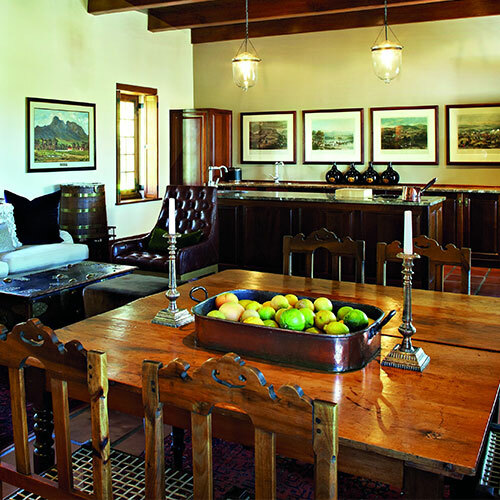 The Cape Colonial Suite and The Dutch East India Suite are connected by inter - leading doors for a larger family or group stays. At the top of a grand staircase, a sumptuous room awaits. Twin beds or a Super king bed can be selected for your stay. The bedroom has east facing casement windows overlooking the vineyards all the way to the distant Hottentot Holland Mountains. There is soft light from the west facing windows with dappled shade from ancient oaks. The magnificent bathroom has a spacious shower, freestanding Victorian bath, chaise longue and dressing table. This suite is a comfortable option for families with lots of space to relax together, share meals or find a private oasis. A series of doors open onto a private terrace with pool loungers and an outside table overlooking the lawn and vineyards. The suite shares a pool with the Dutch East India suite.